The Detroit Youth Poet Laureate is a joint program of Urban Word NYC and the InsideOut Literary Arts, Penmanship Books, the Academy of American Poets, Poetry Society of America and Cave Canem. 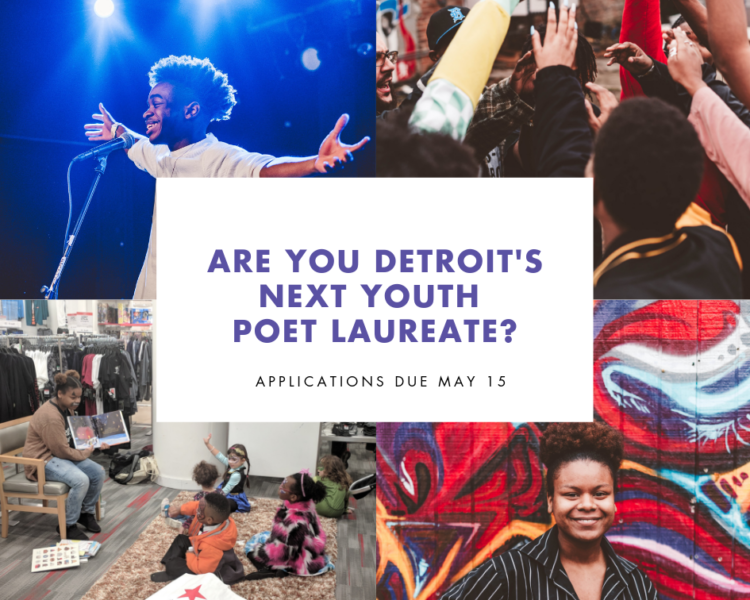 The Detroit Youth Poet Laureate Program aims to identify young writers and leaders who are committed to civic & community engagement, poetry & performance, human relations, diversity and literacy across Michigan. During the months of April and May, InsideOut Literary arts will accept submissions from young poets, rappers, leaders and activists ages 14-19 from across Detroit who are interested in representing Detroit as the 2019 Youth Poet Laureate. A group of esteemed judges will choose 4 Finalists, and we will select one teen to be honored with the title of Detroit Youth Poet Laureate at the Youth Poet Laureate Commencement Performance in mid-June. The second place runner up will be given the distinction of Detroit Youth Poet Ambassador. Along with winning the prestigious title of Detroit Youth Poet Laureate, the winning poet will also win the opportunity to publish their first collection of poems as well as receive intensive mentorship from InsideOut Literary Arts. The Detroit Youth Poet Laureate and Detroit Poet Ambassador will have numerous opportunities and platforms to share their powerful voices, their leadership, and love of Detroit at numerous events across the state. Urban Word and our other partners recognize that youth voice and community engagement are vital for empowering young people to effect positive changes in their communities and beyond. Partners include, Penmanship Books, the Academy of American Poets, Poetry Society of America and Cave Canem. Applicants must be current residents of Detroit and between the ages of 14-19 years old. Must be entering into 9th, 10th, 11th, or 12th grade in the 2019-2020 academic year. Starting April 15th, please submit 5 original poems / raps / performances (and / or YouTube links to your poems). Submit at least one poem that speaks to the theme of “Community and the Future” in Detroit. Fully complete online application, which includes: name, address, phone number and email; detailing of your accomplishments, community service, after school programs, volunteer experiences and awards; along with a cover letter, essay question, and what you may plan to do if awarded this position. Once you are ready, you can submit your application via our online form. Your entire application is due May 15th. The 2019-2020 Detroit Youth Poet Laureate will win a book deal insideOut Literary arts, receive intensive mentorship, and conduct readings and make special appearances throughout Detroit for one (1) year.